For quite a while now I’ve had an inexplicable desire to make chowder and corn bread. Being Australian, these certainly aren’t foods I’ve grown up with, nor are they foods one encounters on a regular basis, in fact I’d had both of them a grand total of once and it was long enough ago to forget what it tasted like and instead turn it into some mythological fantasy where it’s the best food I’d ever had! On the weekend I gave into this desire, spurred on by the fact that I had acquired some maize meal earlier in the week. Let’s start with the chowder. Very creamy and filling, bursting with flavour. This is a meal on it’s own! It’s not quite the Holy Grail of soups I recall (that honour goes to the broccoli soup at The Cuckoo Restaurant) but it was definitely up there as a ‘top five’ soup. The corn bread? Well, it was very much what I imagine a scone would be like if it were made from maize instead of flour. Identical texture and very nice flavour. I can imagine it going very well with a nice pat of butter. 2 of the little cans of creamed corn, or half a big can I guess. In a large saucepan, brown the chicken and onion in a little olive oil then add fresh herbs and stir. Add potatoes, carrots, capsicum and allow to cook for 5 minutes, stirring occasionally. Add the creamed corn and heat for a further 10 minutes. 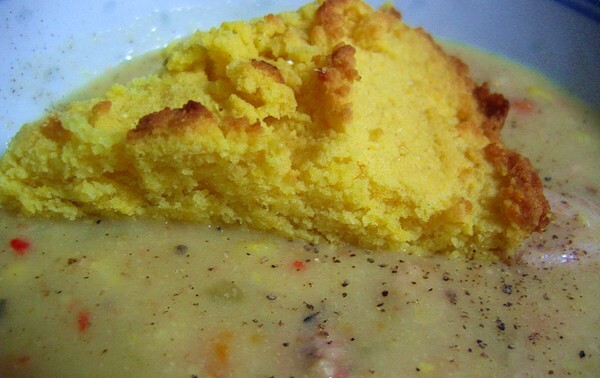 Serve with freshly baked corn bread and season with cracked pepper and sea salt to taste.